At Agile Testing Days, I facilitated a workshop called “DevOps Dojo”. We role-played Dev and Ops developing and operating a production system, then figured out how to do it better together. We wrote down our takeaways on the final “Retrospective” slide. You’re welcome to use the workshop materials for any purpose, including your own workshop. If you do, I’d love to hear about it. I’ve spoken at several instances of pkgsrcCon (including twice in nearby Berlin), but that’s more like a hackathon with some talks. 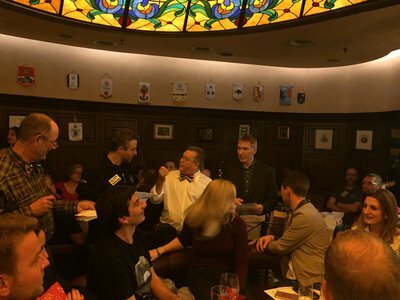 Agile Testing Days was a proper conference, with hundreds of people and plenty of conferring. If someone asks whether I’m an “international speaker”, or claims I am one, I now won’t feel terribly uncomfortable going along with it. I met a fellow WeDoTDD practitioner, Carlos Blé of Codesai. (Here’s their WeDoTDD interview and Pillar’s.) Carlos and I have both relied on Twitter to build our careers. Who knows, maybe we’ll give a talk together about it. At the Tuesday morning Lean Coffee, I found a bug in myself (not a first). What I expected from many previous Lean Coffees: I’d have to control myself to not say all the ideas and suggestions that come to mind. What happened at this Lean Coffee: It was very easy to listen, because I didn’t have many ideas or suggestions, because the topics came from people who were mostly testers. Come to think of it, I have not played every role on a team. I don’t know what it’s like to be a tester. Maybe my guesses about what it’s like are less wrong than some others, but they’re still gonna be wrong. This is evidently my first conference that’s more testing than Agile. Cool! I bet I can learn a lot here. Matt Heusser invited me to perform in the Late Night Cabaret with Bob (Lisa Crispin’s spouse) and Jack (Janet Gregory’s). We did the Four Yorkshiremen sketch as popularized by Monty Python. 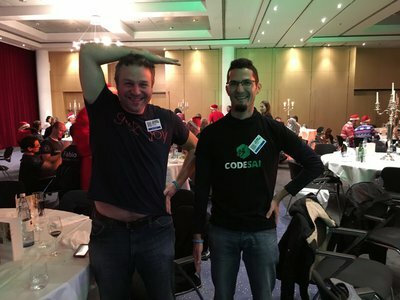 Thanks to Troy Magennis, Markus Gärtner, and Cat Swetel, I decided to try a new idea and spend a few slides drawing attention to the existence and purpose of Agile Testing Days’ Code of Conduct. I can’t tell yet how much good this did, but it took so little time that I’ll keep trying it in future conference presentations and workshops. My next gig will be remote coaching, centered around what we notice as we’re pair programming and delivering working software. I’ve done plenty of coaching and plenty of remote work, but not usually at the same time. Thanks to Lean Coffee with folks like Janet and Alex Schladebeck, I got some good advice on being a more effective influencer when it takes more intention and effort to have face-to-face interactions. As I learn about remote coaching, I expect to write things down at Shape My Work, a wiki about distributed Agile that Alex Harms and I created. You’ll notice it has a Code of Conduct. If it makes good sense to you, we’d love to learn what you’ve learned as a remote Agilist. I found Agile Testing Days to be a lovingly organized and carefully tuned mix of coffee breaks, efficiency, flexibility, and whimsy. The love and whimsy shone through. I’m honored to have been part of it, and I sure as heck hope to be back next year. I’m in Europe through Christmas. I consult, coach, and train. Do you know of anyone who could use a day or three of my services? One aspect of being a tester I do identify with is being frequently challenged to explain their discipline or justify their decisions to people who don’t know what the work is like (and might not recognize the impact of their not knowing). In that regard, I wonder how helpful Agile in 3 Minutes is for testers. Let’s say I could be so lucky as to have a few guest episodes about testing. Who would be the first few people you’d want to hear from? Who has a way with words and ideas, knows the work, and can speak to it — in their unique voice — to help the rest of us understand a bit better?